We’ve had Bo in our family for eight months now and we are about to leave him behind for two weeks as we go off on holiday. It seems like a good time to reflect on the changes we have seen and differences he has made to our family, to Isla and to us as parents. 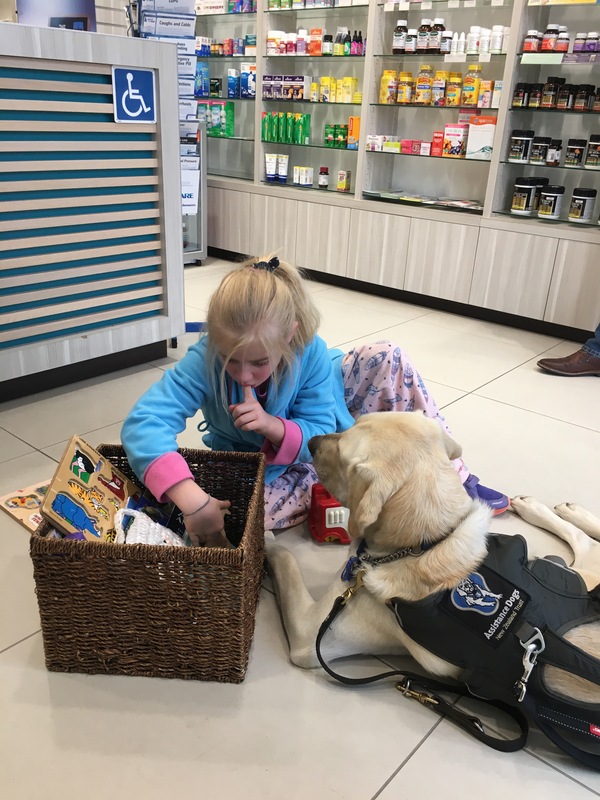 (Although you can take service dogs on planes and they are generally accepted in other parts of the world, the extra vaccinations and examinations required make it a difficult exercise for a short time away). It is great to have a dog as part of our family. 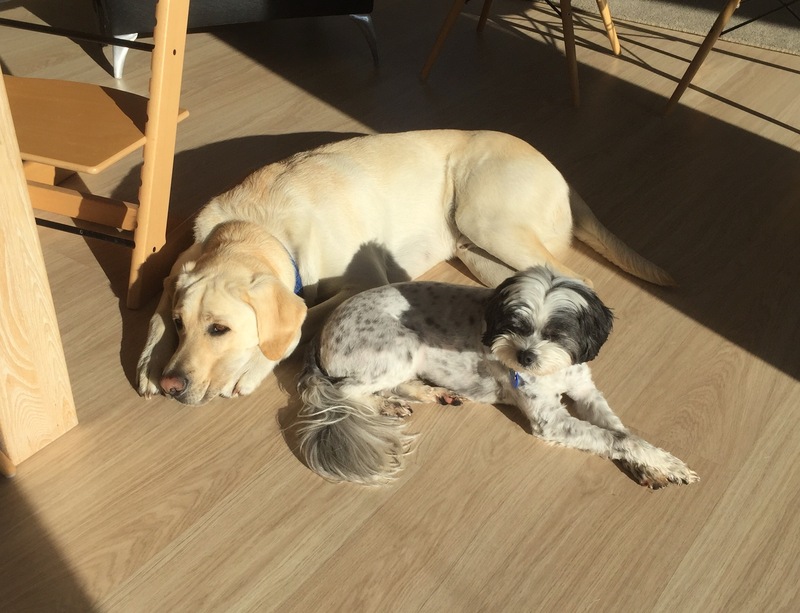 Bo and Mickey (our other furry companion) really are faithful friends, always ready to welcome you at the door when you come home. Bo is no different from other dogs in this respect. He is always keen for a walk and loves nudging you out of bed in the morning to get his breakfast (much better than an alarm clock). Since we’ve had Bo, I have enjoyed getting out regularly to walk him around the neighbourhood. We have a beautiful park on our doorstep and it’s great to have a reason to get amongst it on a regular basis in the fresh air. Bo brings all this but he is also a professional and has a job to do. It is amazing how he slips effortlessly between the two roles, from a family dog to a professional helper, when his working jacket goes on. He immediately slows down and looks for instruction, waiting when he’s told, alternating between encouraging Isla along and preventing her from running off. He has endless patience to get the job done and nothing seems like too much trouble for him. He has definitely taught me a thing or two with this aspect of his character. 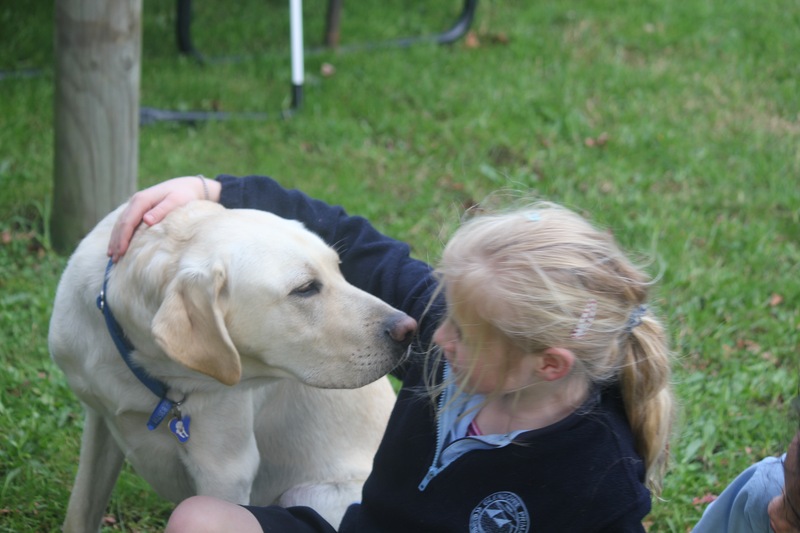 He provides security and a sense of safety for Isla when she is out in public. I took Isla to the doctor the other day when she needed an injection. Rather sensibly, Isla has a fear of needles and injections but unlike neuro-typical kids her age it is hard for her to rationalize this fear and overcome it. Her teacher had done an amazing amount of preparation in forewarning Isla about the injection, but as with a lot of things in life it’s the final few percent that count. Bo provided the final few percent when I took her to the Doctor’s that day. 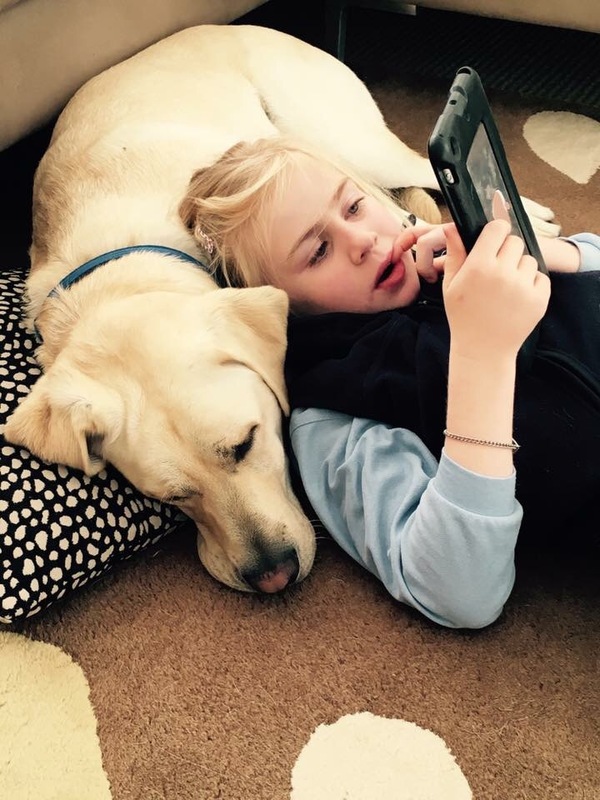 He was a calming influence and a great pillow for her to rest on, somehow Isla knows she is safe when he is around. As well as looking out for Isla in public one of his main roles is to sleep on her bed and provide comfort to her in the night. Austistic kids can wake early or when they wake, want to get up and get going. This would be fine if everyone else in the house could catch up on sleep during the day. Since we have had Bo there have been countless times that I have heard Isla stir but because Bo is in her room she can comfort herself and get herself back to sleep. I can count on the fingers of one hand the amount of times that we have had to get out of bed to help her settle back to sleep in the night. Before Bo we were up in the night more than sleeping through it and when we weren’t up we would have one ear out for Isla. We even went through a period of Isla sleeping on a mattress by our bed because it was quicker to settle her that way than having her in her own room. Needless to say the increased sleep we are all getting has helped immensely for us to live more normally. There have been benefits for me and Sara too. We both feel like we are achieving more in our daily lives. With not being so sleep deprived we exercise more regularly, have less alcohol, can parent better and are able to plan our lives together more. In the eight months since Bo has arrived there have been huge changes in our family for the better. We generally have more energy and awareness and can draw on our reserves to face the challenges that life brings. It could be easy to say that we could have made some of these changes without Bo. Except we didn’t and the catalyst for making a few tweaks to our lives has definitely been the introduction of Bo. So we are all going to miss you when we go on our holidays shortly but we are all looking forward to living more fully with you when we get back refreshed and ready for the challenges of the rest of the year. Next New Website! Please subscribe! Thank you Gareth, just wondered if everybody in your family is a gifted writer? Have a wonderful holiday, hope all goes well and that Bo has a great holiday too.